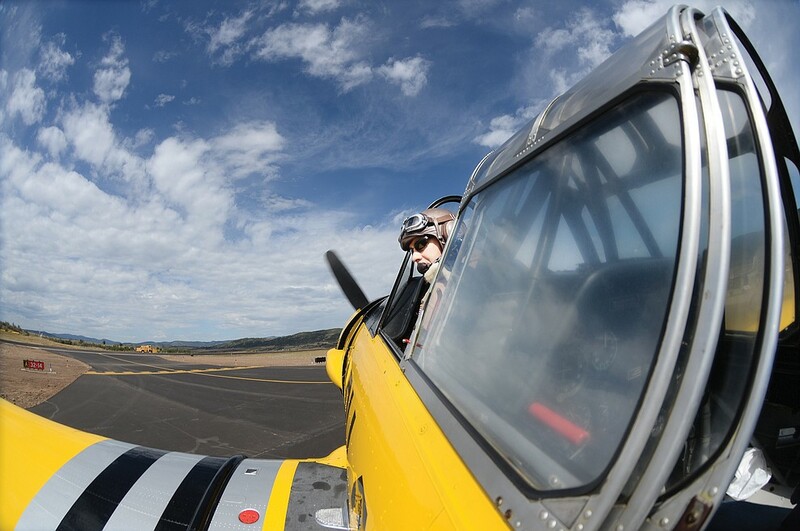 As a surface level performer Barry has distinguished himself as a premier warbird aerobatic performer across the western US. But Pilot Maker Airshows is not just a dynamic, engaging, and graceful full aerobatic demo showcasing the capabilities of our beautiful North American T-6. This year we have takenreinvented the experience to a ground component that uses high-tech virtual reality to show people what the T-6 can do from a whole new perspective, as well as a STEAM presentation capability. Based in Utah, we are readily available up and down the west coast, including parts of Canada, and the Central US. Our motto is “Chase your dreams,” and being a former broadcaster Barry is media savvy. We will engage your local media weeks out to promote your show. From the moment he shows up at your air show he is ready to work; be it on social media initiatives, legacy media interviews, rides, circle jumpers and more. Pilot Maker Air Shows is more than just a demo, it’s a “one stop shop” to help elevate your airshow experience. Whether he is flying for 600,000 at a military base or 6000 at a local show, Barry will be an act your fans won’t soon forget. On the ground Barry loves to mix with the fans, sign autographs, and help shows with pubic outreach both in person and with our targeted media campaign for your show. He will give media rides, circle jumpers, give early morning interviews, and anything else you need to help make your show successful. As a former sports broadcaster Barry knows what to say to help promote your show! Barry is a highly accomplished pilot who has been flying warbirds for over 20 years. He is a formation check pilot for the Commemorative Air Force, serves on the national safety board for that same organization, and teaches aerobatics, spins, and upset recovery every day at his flight school in Heber City, UT. We will provide you with a complete media kit for your show including high quality, high resolution photos, performer bio, video, and will coordinate with local media. Our social media networks have over 6000 followers and will be utilized to promote your show with targeted ad spends to your demographics for your show. Here is a short video of our act that landed us a sponsorship with Lift Aviation for the 2017 season. This really is a must have act, and a class act of a guy, for any air show. We would love to be a part of your show and look forward to hearing from you! Over the past 15 years Barry has been a leader in the warbird community, and for over a decade he has been restoring, selling, and instructing in piston and jet warbirds. With nearly 5000 flight hours to his credit, including leading large formations at air shows across the country, Barry is now bringing that professionalism, passion, and enthusiasm to his solo T-6 act in the Pilot Maker, and is living proof that it's never to late to chase and achieve your dreams. The legendary T-6 brings one-of-a-kind presence to your airshow with it's impressive smoke trail and unique sound, as well as extraordinary ramp presence to your show. Used as the advanced trainer during and after WWII, the T-6 was officially designated as the "Texan" but also known as "The Pilot Maker" for its crucial role in training fighter pilots during the war. It's 600 hp, 9 cylinder Pratt & Whitney radial engine, 42 foot wing span, and classic looks make the T-6 a crowd favorite as it loops, rolls and fills the sky with nostalgia and grace. Our T-6 served extensively as a trainer in the Spanish Air Force for over two decades before being imported back into the US as a surplus aircraft and sold on the civilian market. BH-388 is distinguished by it's black and silver "invasion stripes" with the individual flecks of silver representing the sacrifice made by individuals on behalf of our great nation. This plane is a crowd favorite and one of the most distinctive warbirds on the air show circuit. Pilot Maker Air Shows honors the past by dedicating each performance to the men and women who designed, built, trained, maintained, supported, and flew these great machines. So much was given on our behalf. Our passion is not only about honoring the plane, but also the people of the Greatest Generation, as well as veterans of all generations. Whether you are a kid at your first airshow, or an adult that has always wanted to fly, Barry's story and enthusiasm are inspirational to young and old alike. At Pilot Maker Airshows we believe that with the privilege of being able to fly these great machines comes the responsibility of passing on our enthusiasm, passion, and respect for flight and our country's history. Engaging kids at shows, giving presentations at schools, and inspiring future generations of aviators is just as important to us as putting on a good show.